The Curtis Bay Elementary School came to the Filbert Street Garden to paint rain barrels and pumpkins. We had fun expressing ourselves. Everyone loves to do the fun stuff. Time: 11:00 am. - 2:00 pm. Free Face Painting for children @ 5 p.m.
Come on out and have some fun this is a community event!! Mrs. Edith Gerald grabs the carrots before Bugs Bunny! be rewarded of accomplishments. Filbert Street Garden is located in Curtis Bay 1317 Filbert Street 21226. 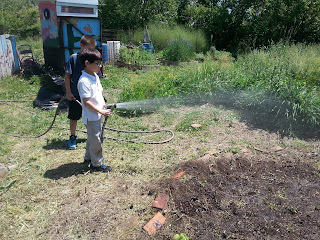 Filbert Street Garden had the pleasure of teaching the Curtis Bay Recreation Center Camp how to make flower pots and plant seeds out of recycle newspaper. The students will care for the plants and the whole plant and paper can be inserted in the ground once the plants start to grow. The Filbert Street Community Gardeners came out on Saturday June 13, 2015 to install a new Native Garden to be enjoyed by all. The excitement of participating in this event was awesome. The Curtis Bay Community working together to achieve a goal. We love getting the job done. Come join us on the next work day July 11, 2015 at 1317 Filbert Street 10:00 a.m.. Don't miss out on the fun. COME ON OUT HAVE SOME FUN & BRING A FRIEND! The fun part to this whole exercise is watering the finish product. We must see what we planted in a few weeks. This is exciting. The rain just washed away into the bay. The Curtis Bay Elementary Students received first hands on experience of how Green Roofs worked.